Catalog Page 2. Order 7" and 10" Smitty Bears with Embroidered Eyes. Order 7" or 10" Smitty Bears with your logo printed onto the front of the t-shirt. The pricing above includes the t-shirt with a one-color logo. We offer three colors of Smitty Bears: white, brown and honey. Please indicate the item number when ordering. You can exchange the t-shirt for one of our many accessories. We ship from New York. If your imprint color is red, black, blue or white, the set-up charge is $25.00. Otherwise, please add a $50 Pantone color match charge. Please look at the size code above to determine the size of the t-shirt. You can visit the Accessory Index to see the colors of t-shirts available for each size. In addition to bears with T-Shirts, we also offer printed accessories including hats, scarves and ribbons. If you order more that 1,000 pieces, we can manufacture custom embroidered your teddy bear or stuffed animal, instead of using a t-shirt. We have over 30 years of experience manufacturing stuffed animals. 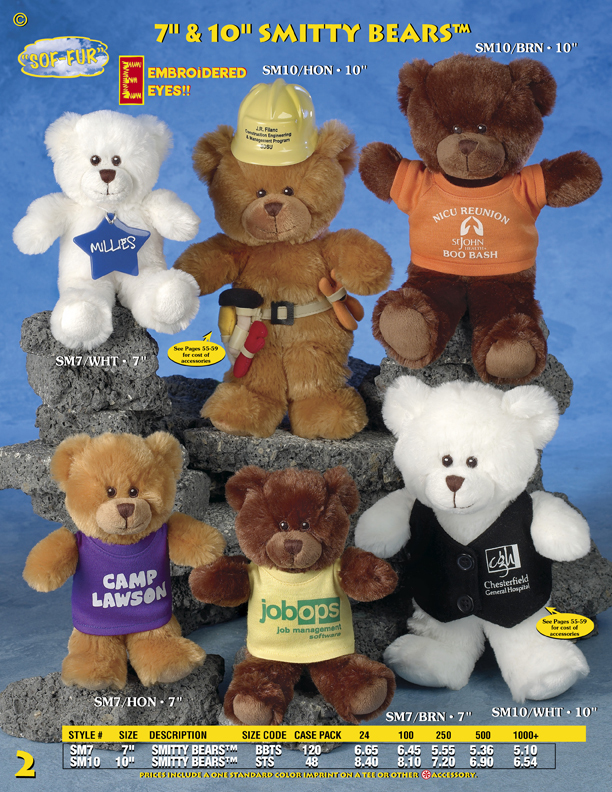 Order your promotional stuffed animals from our plush toy company. Send us your design today.